„First of all, we find the subject very interesting. In the beggining, we thought that it would only fit for adults and that only they can understand it, but the more we thought about it though the more we realized that even and especially kids, who do not understand the concept, still approach problems in a very similar way. By using their imagination and creativity they come up with a solution we might not have thought about in the first place, but a solution that helps us to understand that there is more than one solution to the problem and thinking about it can actually be fun. A part of Little WRO 2017 is a special screening, which will be held as one of Sunday Matinées at WRO, on the 21st of May at 12:30 PM. After the screening we invite all participants for tour through the exhibitions guided by the family curatorial team. To create this screening program, we have invited Antje Heyn, an artist based in Berlin. Viewers might know her from the wonderful, black-and-white animation titled ‘PAWO’, which was presented during Biennale WRO 2015. At WRO we also had the chance to see her stop motion video ‘Lumo’ (2010). ‘Trial and Error’ (2016) is her newest project: an animated movie about creative approaches to problem solving. Her animation was selected from works submitted in response to the open call for Biennale WRO 2017. Antje Heyn, together with the team from her very own Protoplanet Studio, has selected several projects by animated film creators for our young public. These projects are minimalistic, sometimes black and white, and sometimes color animations. All of them are full of humour. Antje Heyn (1979 in Bergen on the Island Rügen / East Germany) is a Berlin based animation director and producer as well as founder of Protoplanet Studio. She studied visual communication at University of Art Berlin-Weissensee with main focus on animation and illustration. Besides setting her heart on creating characters and bringing them to life, she conducts workshops for kids and teaches animation at art academies. Antje possesses a keen eye for detail and subtleties – which makes her an incorruptible supervisor – and a deeply felt humanism stretching right into the world of her creations. Protoplanet Studio is an independent animation studio and production company based in the heart of Berlin. ‘Our mission is to make the world a little brighter by bringing unique characters to life’ – it is what they say about their work. Their animations have won many awards at film festivals around the world – and, what is even more important to them, been received very warmly by audiences of all kinds, be they adult or preschool. ‘People tell us that they love our minimalist approach to design and animation; especially in times of media overstimulation. 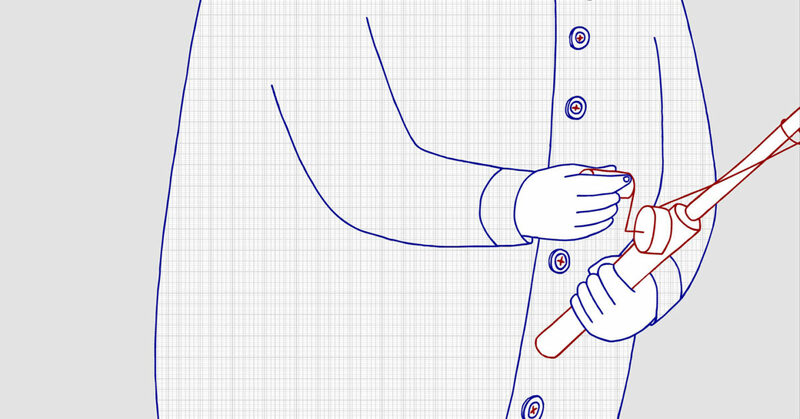 We have a passion for storytelling outside the box and prefer simplicity over overwhelming and restless animations. Not only for that, we also like to make use of just the right dose of improvisation from time to time and find out where the spark of the moment leads us to’. A little black bird comes along to water a yellow leaf. 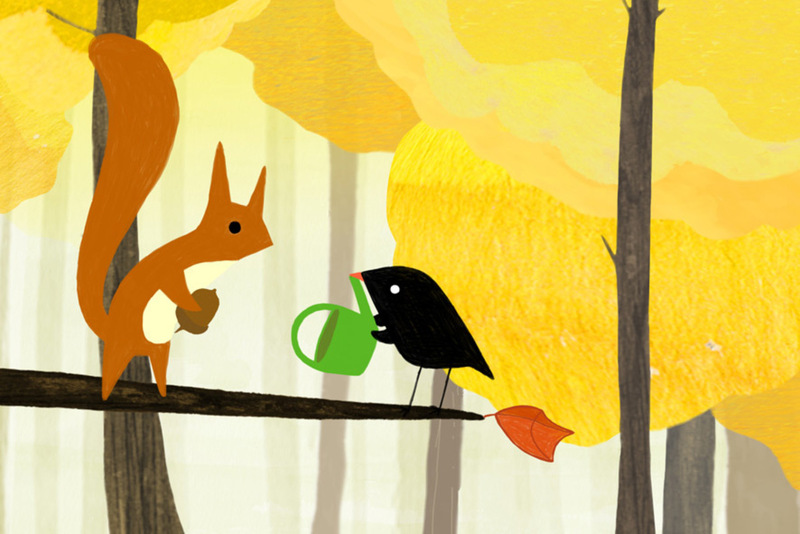 Suddenly, a squirrel nicks the bird’s bright green watering can and an exciting chase through the forest begins. But behind the fiery red fox is already waiting for his chance. 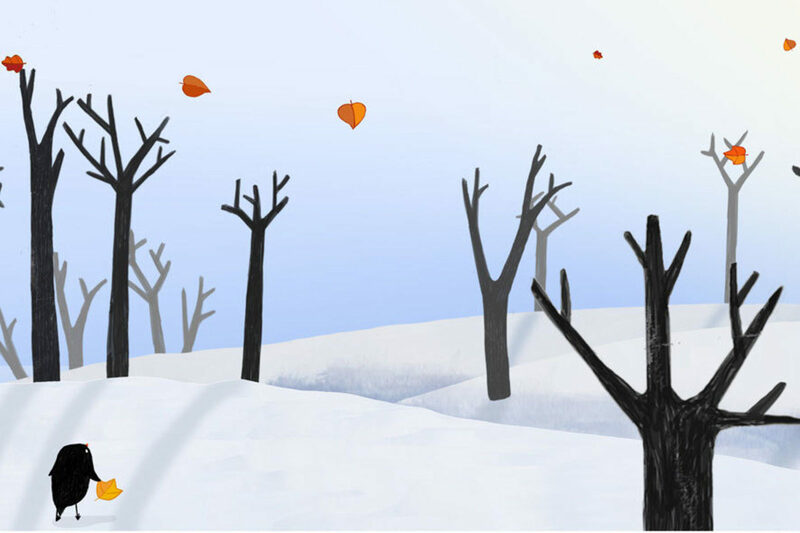 The winter wind blows away the little bird’s best friend, an autumn leaf. He follows it and discovers the forest and the big world beyond. 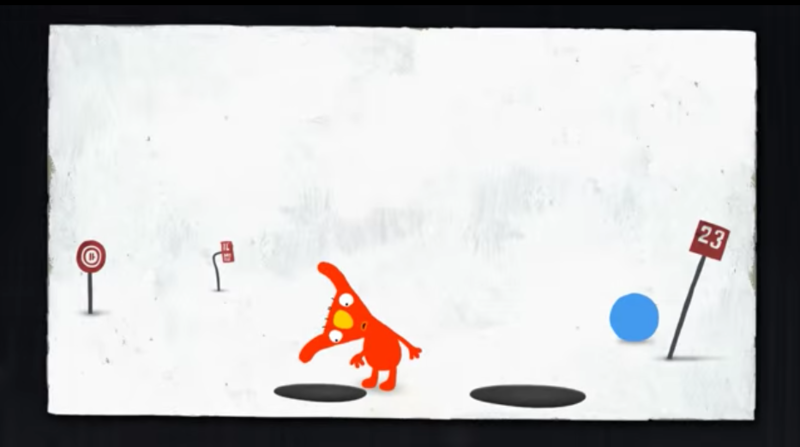 But mind the hungry fox, little bird! 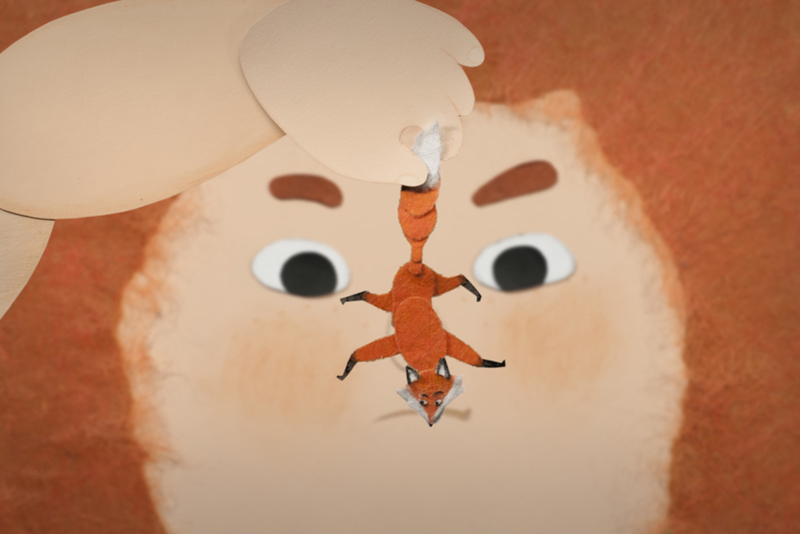 In the middle of a luxuriant garden, a teeny-weeny fox meets a daring little girl who grows giant plants! By lucky coincidence, they realise that they can grow objects too; the clever little devils think up all sorts of things to do. 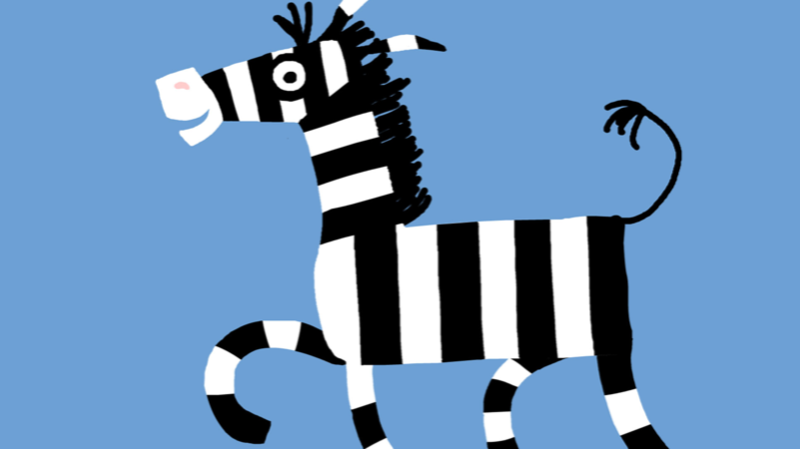 One day the zebra runs against a tree and learns something. High above in a tree the little Bird cherishes and nurtures the green leaves of his home. Suddenly a hungry caterpillar sets out to eat the appetizing leaves. 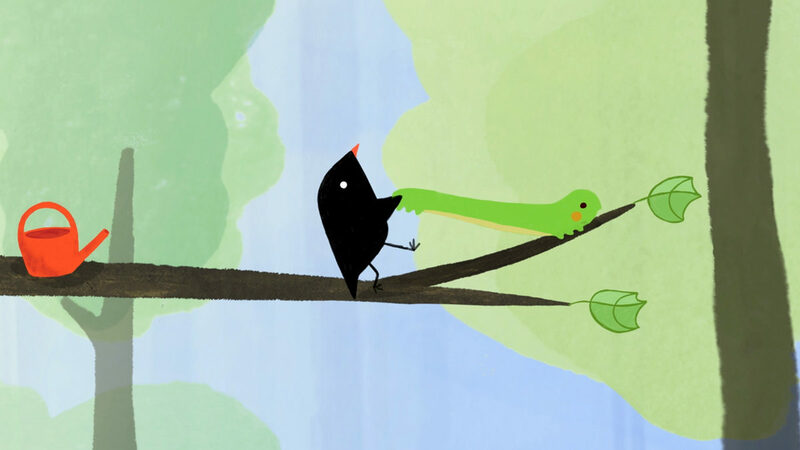 The little Bird manages to lure away the glutton and an adventurous journey begins. 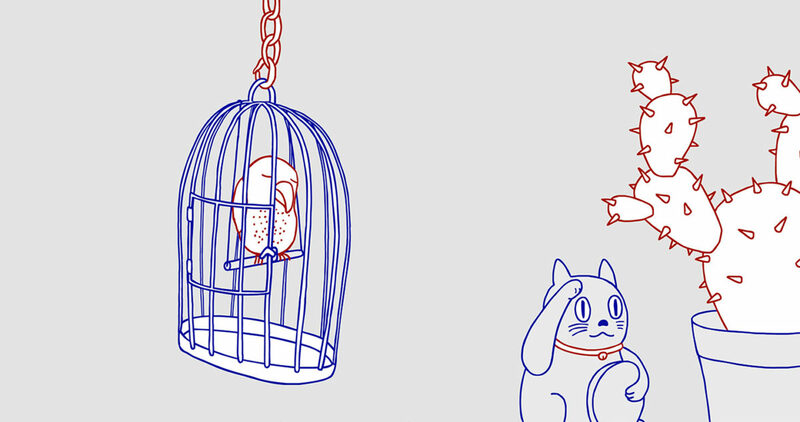 The animations is a play of shapes illustrating the dialog between two mythological areas – the West and the East. 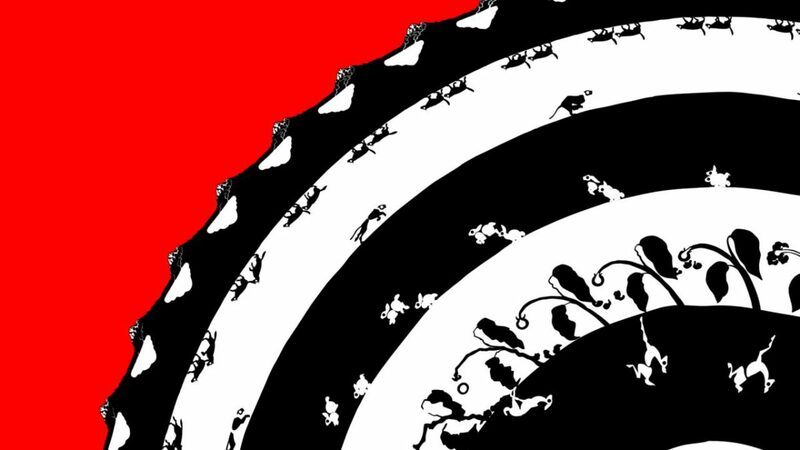 It is a creation story in which the colors red, white and black oscillate in unison and against each other, they come together creating new shapes and come undone again.